Location of the Climate-Smart Villages AR4D sites across the five focal CCAFS regions. Bonilla-Findji O, Bui Tan Y, Khatri-Chhetri A, Kimeli P, Leguia-Hidalgo E, Martinez- Baron D, Ortega LA, Ouedraogo M, Radeny M, Recha J. 2017. 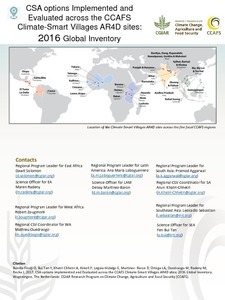 CSA options implemented and Evaluated across the CCAFS Climate-Smart Villages AR4D sites: 2016 Global Inventory. Wageningen, The Netherlands: CGIAR Research Program on Climate Change, Agriculture and Food Security (CCAFS).